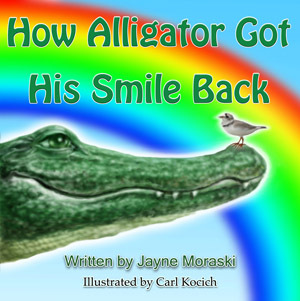 First I want to welcome Jayne Moraski to the the Guardian Angel Publishing Family. Congratulations, Jayne, on publishing your first picture book. What made alligator lose his smile in the first place? For the answer, we must take a look at this “just so” story made up by Jayne Moraski and illustrated by Carl Kocich. This hurt Alligator’s feelings and Alligator cried and cried salty tears. He cried so much he turned the fresh-water swamp salty. The cypress trees had to pull away from the salty water. Alligator’s friends, the little plover birds, asked the Great Spirit for help. The Great Spirit granted Alligator one wish. Alligator simply wanted to have legs. The wish was granted. Now Alligator walks on land the same as Frog. And he SMILES! Frog wonders about that smile. And when he sees Alligator smiling that mysterious smile, he stops his loud croaking. There’s no boasting in Alligator’s presence. The pictures by illustrator Carl Kocich are too pleasant to scare a little child. The early ones of the distant past give a dreamy cast to the atmosphere. And when Alligator cries, the reader feels sympathy for him. The bordering around each page is a bonus that adds to the beauty of the book. Some of this story is made up, but the book also has interesting facts that make learning about swamps and amphibians (that’s what Frog is) and reptiles (Alligator is one) lots of fun. There are also suggestions for activities in which kids compare and contrast the two species in the book using textual clues. Some students in classrooms have already enjoyed doing the activities. (A note about “just so” stories. That is the term Rudyard Kipling used when he made up pretend ways that animals changed from some original form to the one we know today. “The Elephant’s Child” or “How the Elephant Got its Trunk” is one of the best. I love this kind of story). Jayne calls her story a modern myth with a science twist. go ANGELS and go GATORS! This is a great book for kids, who love herps! The illustrations are great and teh followup activities are fun reinforcement for info learned through an adorable story. I will share this when I take the outreach program from the Florida Museum to schools! Hi Barbara, such a great review. Really makes you want to read the story. Thanks for sharing. It was a great pleasure for me to review Jayne’s book and welcome her to the Guardian Angel Family. This sounds like a really cute story. I didn’t know the phrase “just so” stories but I’ve always thought they were creative.